Murano Serenella is a single-platform vaporetto stop on the quiet western side of Venice's glassmaking island. (See our 11-page Murano travel guide.) The surrounding area is mostly residential and industrial. 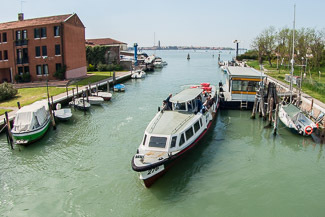 There are no hotels in the immediate vicinity, but Murano is a fairly compact island, so consult our Murano hotel listings if you'll be arriving or departing at the Serenella stop. Note: Serenella does not have a ticket booth or vending machine, so here's what to do if you need to board a water bus without a valid ticket or Tourist Travel Card.